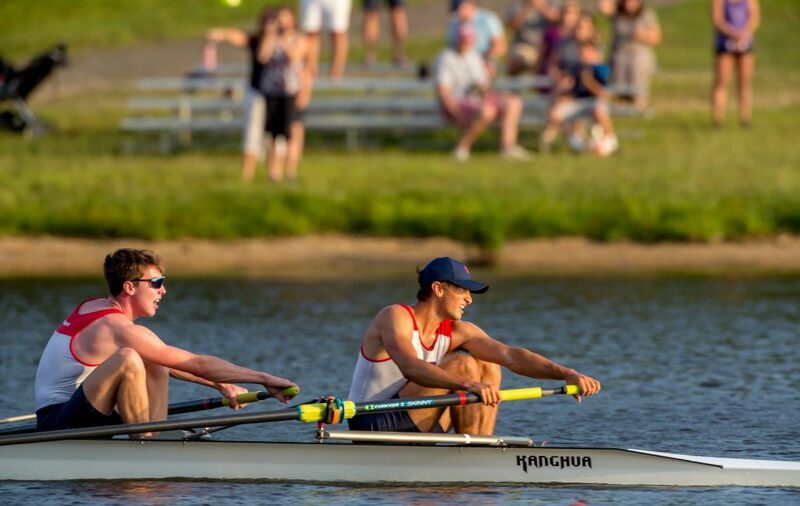 West Windsor, NJ – Daniel Stoddard (West Windsor, NJ) and Andrew Hickey (Yardley, PA) have one more competition before they leave junior rowing behind them and join the ranks of collegiate rowers, and it will be the most significant. Stoddard and Hickey will compete as part of the U.S. Junior National team at the World Rowing Junior Championships in Trakai, Lithuania on August 2-6. The duo qualified for the team by winning the un-coxed pair event at the Under 19 World Championship Trials at Mercer Lake on June 29. “It will be an honor to represent the United States in international competition,” said Hickey. “I can’t wait for the moment at the starting line when we hear the referee announce our boat as ‘U.S.A’,” he added. Stoddard and Hickey served as senior co-captains for the Princeton National Rowing Association’s Mercer Rowing Club this spring and competed in the varsity eight with coxswain event at the 2017 Youth National Championships. “We feel like the pair is our best event,” said Stoddard. “We have been good friends since we started rowing five years ago. We communicate well, which is really important in a pair” he added. The pair, also referred to as the 2-, is the most challenging boat for rowers to learn to row because the rowers must handle the tasks of steering and communicating the stroke rate which are the coxswain’s responsibility in most other boats. One rower, Stoddard, steers the boat with a foot apparatus, and the other rower, Hickey, calls out adjustments to the stroke rate. The rowers don’t have the benefit of facing in the direction the boat is travelling, as a coxswain would. Stoddard and Hickey will be accompanied to the World Rowing Junior Championships by their coach, Justin Ochal, who has coached them for the past three years as varsity boys coach at PNRA/Mercer. “Coach deserves a lot of the credit for getting us to this point,” said Stoddard. “Over the years, he has worked with us on technique and conditioning but also has taught us a lot about the mental part of rowing,” added Stoddard. “Coach always finds opportunities to give us lessons on character, teamwork, and commitment,” commented Hickey. “He really cares about the guys he coaches,” he added. The pair will continue training at Mercer Lake until they depart for Lithuania. They are fundraising to help cover the costs associated with competing at a world championship. More information is available at www.nrf.rallyme.com/rallies/8073. Other PNRA/Mercer junior rowers have seen success in competition this summer as well. Emmanuelle Adamson (Princeton, NJ) and Eli Kalfaian (Millstone, NJ) were invited to be part of the U.S. Junior National Development Team and competed in CanAmMex events at Elk Lake in British Columbia, Canada this past weekend. Adamson rowed in the girls’ varsity eight with coxswain boat which took first place. Kalfaian rowed in the boys’ varsity eight with coxswain which also took first place. Adamson and Kalfaian will return to PNRA/Mercer in the fall and serve as co-captains for the team. The Princeton National Rowing Association, a 501c3 organization, operates the Finn M.W. Caspersen Rowing Center located on the shores of Mercer Lake in West Windsor, New Jersey. The Princeton National Rowing Association is dedicated to operating a world-class training site for our nation’s elite athletes, providing opportunities for area youth to excel in the sport of rowing and to expand rowing in the greater Mercer County area through community based programs. The Mercer Junior Rowing Program provides rowing opportunities for the youth from over 25 Mercer County area high schools. The center is a home to the USRowing National and Olympic Teams, as well as rowing clubs and schools, including the Hun School, Lawrenceville School and Peddie School. PNRA received generous support from JLRacing, Holiday Inn and Residence Inn by Marriott.